The beautiful Pine Dale Resort terraced into the hills on the shoreline of the Aegean Sea hosted representatives from thirty-seven countries April 4-10 in Kusadasi, Turkey. The occasion was the second Global Leadership Summit, sponsored by the World Missions Ministries Division (WMMD) of IPHC. The Apostle Paul navigated those same waters in his church planting ministry two thousand years ago. The Holy Spirit who guided Paul on his missionary journeys was present in the sessions of the Summit – very present, I’ll never forget how present! The Leadership Summit concept was launched in 2014 by Bishop Talmadge Gardner. His vision was to bring together as many IPHC national bishops as possible at least bi-annually, as well as superintendents of conferences in the national churches, and in some cases, emerging leaders. All IPHC conferences under the umbrella of World Missions Ministries are now indigenous. They all have national leaders who merit quality training and opportunity to fellowship and bond with their peers and international IPHC church leaders. This reality makes the idea that birthed the Summit a stroke of wisdom. Kusadasi was just that – four special days of study and fellowship in the Holy Spirit. I went to the Summit with some awareness of the immigration problems in the Middle East today. I have returned home with a greatly broadened understanding. Civil war and the rise of ISIS in Syria has created millions of refugees that are flooding mostly into Europe. The majority of these immigrants have come from areas that have been closed to IPHC missionaries. But now that they are displaced, the opportunity is staggering. Many are wide open to the gospel. The need to place missionaries among these migrants in Europe is huge. This is a case where the politics of immigration and the values of the Lord’s church differ greatly. Moses spoke what God told him to say some 3500 years ago, and the standard has not changed: “The Lord your God is God of gods and Lord of lords, the great God, mighty and awesome, who shows no partiality and accepts no bribes. He defends the cause of the fatherless and the widow, and loves the alien, giving him food and clothing. And you are to love those who are aliens, for you yourselves were aliens [immigrants] in Egypt” (Deuteronomy 10:17-20). Ismail Serinken leads IPHC ministry in Turkey. He was born into a staunchly Muslim family and found Christ as a university student. Since his conversion, Ismail has been able to lead his father and mother to the Lord. He is the founder and pastor of the two IPHC churches in Turkey – Ankara (Turkey’s capitol city) and Laodicea. Bishop Valarii Reshetinskyi is pastor of Christian Hope Church in Kiev, Ukraine, a country that is feeling the horror of war intended to bring the country back into the Soviet orbit. His church is an unfinished stadium that he purchased for pennies on the dollar after the Iron Curtain fell in 1989. Bishop Reshetinskyi has been developing the huge facility ever since, and making progress. Hehas also planted 150 churches since the mid-1990’s and has a goal to launch ten more before the end of this year. He holds a doctorate in Sonar Science and leads the creationist movement in the Ukraine. Pedro Vargas Reyes was recently elected IPHC bishop of the Dominican Republic. He holds a degree in law. Pastor Peter Lakatos is president of the Free Christian Fellowship, IPHC, in Debrecen, Hungary. He is pastor of the Debrecen Church and teaches music as a university professor. He leads an Interchurch Worship Camp each year that attracts over 1,000 participants. The event includes a variety of workshops, including prophetic ministry. Joseph Agius leads Word of Life Church on the Mediterranean island of Malta. He told me how he came to the Lord out of a life of deep sin. Joseph now has two master’s degrees and is working on his doctorate. He directs the Global Institute of Theology on Malta. Moses Alvarez is the national Bible School director of the Costa Rican Conference. He holds a B.S. in Business Administration and has worked as an internal auditor, financial analyst and business consultant. Asher Mansha is the national leader of IPHC in Pakistan, the second largest unreached Muslim nation in the world. He is the founder of Christ Holiness Church and is actively involved in crusade evangelism, youth seminars and humanitarian outreaches. He broadcasts weekly on a Christian TV station in Pakistan and has special gifts in apologetics that enable him to engage and communicate with Muslims. Bishop Julio Cesar Villanueva Perez is lead pastor of Centro Cristiano Berea in Mexicali, Mexico. He serves as the national vice-president of IPHC churches on the Pacific Coast of Mexico. Dr. Cesar holds three bachelor’s degrees, three masters’ and two doctorates. Jonathan Chatendeuka serves as IPHC bishop in Zimbabwe. He became a believer in 1981 and demonstrates special abilities as a speaker and equipper of leaders and pastors. He has seen many conversions in his ministry, as well as miracles of healing and deliverance. He also functions in prophetic ministry. Tony Mkamanga is national bishop of the IPHC in Malawi and is senior pastor of the Kaning/ina church in Mzuzu where he has served for twenty-two years. He is a church planter who is dedicated to equipping leaders through Bible school, seminars, leadership training, and discipleship. He and his wife, Charity, have two daughters, Grace and Truth. The Summit also included the four WMM continental directors (Bob Cave – Europe and the Middle East; Dan Clowers – LAMCAR Central and South America and the Caribbean; Russell Board – Asia and the Pacific; and Ernest Turner – Africa). In Bishop Gardner’s absence, the Summit was hosted by three men from the WMMD office in Oklahoma City: Matt Bennett – director of People to People Ministries; Steve Cofer – director of Global Outreach, Coffee House Ministry and Itineration; and Max Barroso – director of The Awakening. Four speakers invited by Bishop Gardner did the teaching at the Summit. Hans Hess serves as senior pastor of Fountain of Life, a 1,000 member church in the Redemption Ministries Conference. Hans spoke on Tuesday and made a Holy Spirit anointed presentation on the subject of a missional church. Hans is a Ph.D. candidate at Regent University. My teaching role was on Wednesday. I presented Jesus as the ultimate model for servant ministry, and gave two lessons from the Gospel of John. The first showed what the Apostle John said were the things Jesus “knew” that strengthened Him going into his trial and crucifixion. The second was a study of the Lord’s High Priestly prayer in John 17, presenting ten leadership principles based on Jesus’ intercession in the prayer. Dr. Terry Tramel, New Testament professor at Southwestern Christian University taught four sessions Thursday on leadership principles from the life of King David. On Friday morning Dr. Tramel and I gave a two-hour tag teaching presentation in half-hour units that pulled together four themes: the Biblical roots of the church, the Azusa Street Revival of 1906-1909, how World Missions Ministries was birthed in prophecy growing out of the Azusa Street Pentecost, and the blessed hope of the church that is ahead for the people of God. The strong presence of the Holy Spirit confirmed the word to the leaders. On Friday afternoon Dr. Mark Wilson, the founder of the Seven Churches Network, presented a slide presentation on Asia Minor in the Roman Empire (now modern Turkey). It was the home of the first missionary ministry of Paul and his traveling companions, Barnabas and later Silas. Dr. Wilson and his wife make their home in Antalya, Turkey. 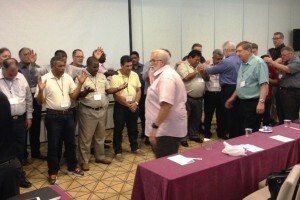 Eight regional directors of World Missions Ministries were also present and able to interact with the national leaders: Harold Presley, Northwest Europe; Linwood Berry, Southwest Europe; Tim Salley, Southeast Asia; Ron Wooten, East Africa; Joe Delport, Southern Africa; Ron Roy, Mexico; Darrel Clowers, West Indies and the Caribbean; and Jeff Willhoite, Indo-China. The Summit concluded on Sunday (April 10) with a commissioning service in the PH church in Laodicea, led by Pastor Hess. Laodicea is the historic site of the seventh of the Seven Churches of Asia named in the Revelation, the book the Lord Jesus gave to the Apostle John. The national leaders received prayer and blessing that sent them home renewed in Spirit. For many however, returning to their assignments embraces the real possibility of persecution as they lead their ministries. These brave servants of our Lord deserve our prayers and financial support.